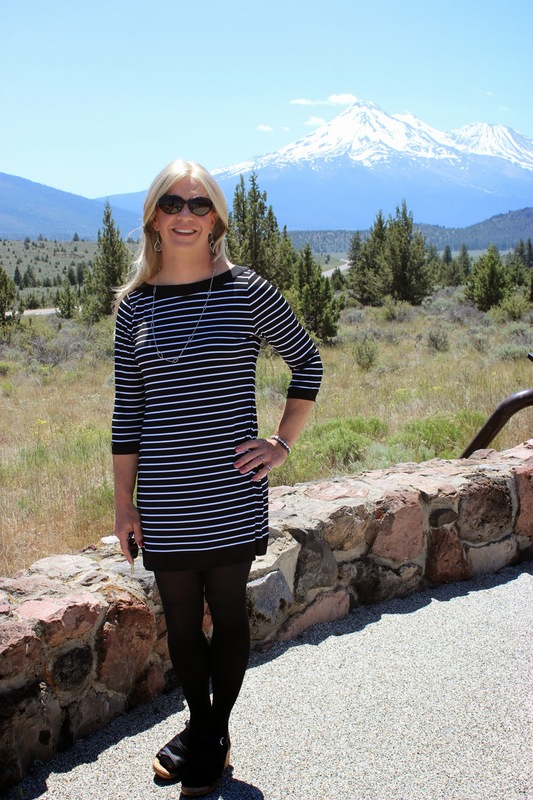 Unordinary Style: Outfit for 6-14-14 - Belt or No Belt? I was thinking about this post today while I was working around my house and the thought I had was, 'what is a tunic with a belt?' The answer I came up with is 'a dress.' And I think that is why I have the opinion that I do about the above outfit. I don't like the belt. Which is weird. Normally I really like belts. They can do so much for you, like say identifying your waist. But with the tunic pictured above, I really think it does away completely with the look of a tunic. So what is the point then of wearing the tunic at all? Why not just wear a dress. Maybe that is why both Jules and I voted for the tunic without the belt. What is your vote? Maybe I should figure out how to make a poll and put it on my blog. Hmm... okay maybe not. Oh and this is also the first time I have worn tights with a strappy shoe. It was kind of odd for me, but I figured why not? I actually wore this outfit while Jules and I traveled from Bend Oregon back down into California. That evening we ended up in Redding. But along the way we stopped and took pictures of each other in front of Mt. Shasta. Beautiful place. I really like that picture. I think you can tell the shape of the tunic better. Nadine, this tunic definitely goes without belt. But, the best picture is that one where you wear the belt, since your smile shines better. Thanks so much! After relooking at the pictures, I would agree with you, my smile does look better in that pic. Higs back at you sweetie. Thanks Bobbie. You are very kind. I appreciate the lovely figure comment. Interesting take on the outfits. In the pictures I kind of like the belted version better but in real life I liked the unbelted version. It is kind of hard to see how the unbelted tunic moves in a picture, but IRL without the belt it makes a big difference. Thanks for the thoughts cutie! I kinda like the belt! It defines your hips wich are amazing! Still waiting for some active wear! T.
Thanks T. Yeah, I dunno about the workout wear. You may be waiting for quite some time. But maybe, you never know, huh? I think belt, shows more curves, but I think the stripes add some dimension that allow you to get away with no belt. However solid tunic needs belt. By the way thank you for making me a belt believer, I hated them before you.